Phosvitins are the principal phosphoproteins in the eggs of oviparous vertebrates. They have an exceptionally high serine content and most, or even all, of the serine residues are esterified to phosphate. The phosphorylated residues tend to occur in uninterrupted runs of as many as 28 phosphoserines (as inXenopus phosvitin). This unique structural feature gives phosvitins extraordinary properties and can be expected to play a key role in phosvitin function. For example, the concentration of phosphate groups provides for numerous highly efficient metal-binding sites in clusters. The mode of binding had been shown to be affected by the size of the protein and the degree to which serine residues are phosphorylated. For structure-function studies of phosvitins (and other polyphospho-proteins), phosphopeptides of differentiated structural complexity are desirable. 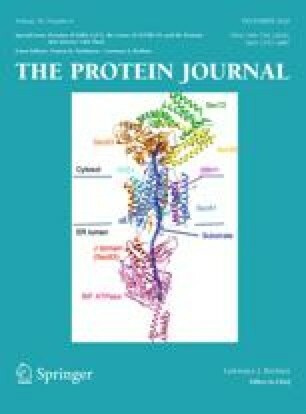 Such model peptides were produced in this work by limited proteolysis of chicken phosvitin, and oligophosphopeptides of widely varying sizes, phosphoserine content, and sequence were purified and characterized. These include phosvitin segments containing one, two, or several oligophosphoserine runs, corresponding to segments of the N-terminal, C-terminal, and core sequence of the protein.